Feels kinda dumb to put something so simple and Low Sodium up but it was so tasty! The turnip caramelises as does the garlic and as long as you use good quality extra virgin olive oil you just can’t go wrong. 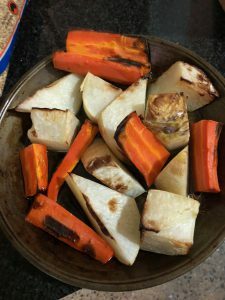 Whack vegetables into an oven tray, coat with pepper and oil and cook at 200 Celcius for 15 minutes or till the vegetables start to brown.